As a core of our company we offer a high standard of experience, paired with the most modern technology, in this sector. Our masters cater for the best quality concern the aids which are produced individually. We have no limits, because we emphasize to be responsive to the needs of our clients and produce the right aids. More quality of life trough mobility is the aim of our work. For this we set our patients in the center of our work. We are not limited in one specialization – we are able to produce the right solution in all areas of the orthopedist and rehab technology. In our branches in Stralsund, Pritzwalk, Perleberg, Hagenow and Demmin, we advise you personally. In our head office in Rostock we have place on 1000m2. Beside our medical supply store, we have our factory for orthopedist with an advisory center. 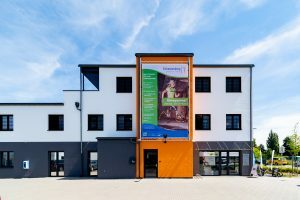 We offer orthosis for kids and athletics, construction of prothesis in all technics as well as the construction of corsets – we are your partner in all relevant areas and exerted for your wellbeing. To be up to date all time, we participate in different workshops – and for this, there is no way to long. We are really proud that our clients came for a long time and give us their trust and that also young people came to us with complexes tasks. If you want to know more about us, feel free to contact us. We are looking forward to you!